When the Second World War broke out in September 1939, the government of Australia was in the hands of Menzies, Fadden and Spender. Anti-working class and pro-fascist, they had been pursuing a policy of appeasement towards the Japanese militarists and were eager for an accommodation to be reached with the Nazis so that the war could be turned against the Soviet Union. Following the lead of the of the Daladier government in France, Menzies and company utilised the war to suppress the communists at home. The Crimes Act, passed considerably earlier by the Bruce government, was invoked to try to make communist work impossible. Individuals were prosecuted, as was the organisation “Friends of the Soviet Union” as a forerunner to banning the Communist Party of Australia (CPA) itself. These attacks were beaten back as the party fought against the policy of appeasement of Nazi Germany and against the policy of “switching the war”. Its members defended the Soviet Union against the campaign of slanders which went on day after day even before the war. Above all else, the communist party applied itself in this period to leading the mass political and economic struggles of the workers for democratic rights and against the burden of the war being foisted on to the workers. The boosting of profits by speed ups and the breaking down of working conditions “in the interests of the war effort” was opposed and under party leadership, there were strikes of miners, metalworkers and others. 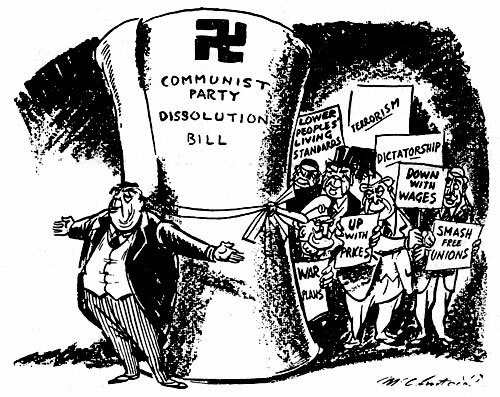 On June 15, 1940, the Menzies government declared the Communist Party to be an illegal organisation under the National Security Regulations. However, despite police raids, arrests of members and confiscation of property (especially books), the party continued to function and communist activity actually increased. During the time, the character of the war had been changing·, assuming more and more – in the countries invaded and occupied by Germany – the aspect of an anti-fascist war of liberation. This process came to its pinnacle with the German attack on the Soviet Union on June 22, 1941, for the Soviet Union’s only aim in the war that followed was liberation. The CPA now called for the fullest support for what had become a just war of liberation. However, Australia was still saddled with the reactionary Menzies/Fadden crew. The change in the character of the war created the conditions for their removal. A letter signed by 15 trade union leaders, all communists, was sent to the Labor party leader, John Curtin, on September 17, 1941. It spoke of the need to replace the then federal government with a Labor government. The letter called for trade union representation on boards controlling war production, called for lifting the ban on the CPA, establishment of diplomatic relations with the USSR and, most significantly, promised that the CPA would use its influence “to secure continuity of production and avoidance of industrial disputes”. This unity proposal was a very powerful incentive to the Curtin leadership of the Australian Labor Party which was reluctant to move against Menzies and Fadden. After the Labor Party won an overwhelming victory in New South Wales, for which the communists could take much of the credit, Curtin was prepared to act. At long last a federal Labor government came into existence. The Communist, Party’s policy now was for national unity around the Curtin government and for the maximum strengthening of the war effort. The party gave the lead for the avoidance of strikes as much as possible, against absenteeism and for a worker-based labour discipline. In the struggle for production, the CPA had to fight strenuously against the right-wing of the ALP and the trade unions who set out to sabotage the policy of boosting production. Union leaders who had spent years advocating arbitration and the ways of “class peace” suddenly became ultra-militant and fomented strikes, sowing confusion and helping the reactionaries. The Trotskyists also rejected the party’s line of “Everything for the War Effort” and organised disruptive stoppages, often around workers’ legitimate grievances. Employers often provoked strikes in order to undermine the Curtin government. The Communist Party organisations on the job waged a hard and bitter fight in order to implement the policy of ensuring increased production. The changed character of the war and the advent of the Curtin government created favourable conditions for the campaign to lift the ban on the CPA. Nevertheless, it took more than a year of mass mobilisation and pressure before the Labor government agreed and lifted the ban. From the moment of the German invasion of the USSR, the Communist Party campaigned strenuously for the opening of a second front in Europe to shorten the war. After Japan’s launching of their Pacific war, the CPA also campaigned for the British to release the jailed Indian Congress leaders and to create a Provisional Indian National Government (including the communists) which could bring India into the war against Japan by way of Burma and linking up with all the Chinese armies fighting for liberation from the Japanese. British imperialism found this proposal somewhat alarming. Besides mobilising the workers for the war effort and launching the campaign for increased production, the Communist Party recruited directly for the armed forces. Over 4,000 communists served in the armed forces during the course of the war. Many lost their lives. The party waged several campaigns around questions affecting the conditions under which the troops lived, worked and fought. Considerable support was developed among service men and women. The party issued a program – “A Plan For The Fighting Man” – in July 1944. During the Second World War, the Communist Party of Australia enjoyed a period of spectacular growth. Membership in 1940 was just over 4,000. By May 1942, despite illegality, it reached 7,200. In December 1942, it was 16,000 and it reached approximately 25,000 by the end of the war. This phenomenal growth was the direct result of the political line followed by the party. Its consistent defence of the Soviet Union had been proven correct, its consistent struggle against the reactionaries and for democratic rights was self-evidently correct. Above all, the party’s policy of “everything for the war effort” – restraining strikes while protecting workers’ interests, maintaining stability, boosting production – was identified with Australia’s national interest. The Communist Party was identified by the Australian people with the struggle against German and Japanese aggression, with the struggle against fascism and with the defence of Australia’s independence which was threatened by Japanese invasion.